TrailBlazer Pet Supply and Chico Area Recreation and Parks District are excited to announce the fifth annual doggie swim day at Shapiro Pool! This event will include 30 min swim times, Splash Dog demos, a splash dog competition, raffle, prizes and give aways to all those who participate. Walk Woof Wag, an annual dog fun walk and fundraiser, was inspired by Chico youth, Bryce Velasco, who wanted to honor his dog, Jasmine, who was adopted through Chico Animal Shelter. In 2014, Bryce was in the 8th grade at Marsh Junior High School and taking a leadership class that requires students perform a service project. Bryce’s vision was a walk that would be festive and fun and raise funds for Chico Animal Shelter. He approached Dr. Sarah Richardson, owner of The Canine Connection (Jasmine’s “go to” place for training, daycare, and boarding) and asked if she would help him transform his idea into reality. She and Bryce joined forces and planning for the first Walk Woof Wag gathering (held in 2014) began. It was decided that funds raised through Walk Woof Wag would go to Chico Animal Shelter’s medical fund so that the animals in their care can receive the medical care they need while they await loving, permanent homes. To learn more about this event or to sign up click here! Take the fresh food challenge and for 20 days, replace 20% of your pet’s kibble with 20% fresh food ingredients! Attend an in store class, where we will discuss the best foods to include in your pet’s diet for the highest nutritional impact! Class Cost: $10- sign up in the store today to reserve your spot! All participants in the challenge will be entered to win a FREE Honest Kitchen Cook Book worth $25! Jill from Jill's Elegant Dog Boutique will be holding a pop-up event at TrailBlazer Pet Supply, show casing all kinds of fun and extravagant dog clothing, collars, and apparel for your furry friend. If you miss Jill's Elegant Dog Boutique and all that she offered be sure you don't miss this one time event! Please bring cash to this event. TrailBlazer Pet Supply will be closed for the 4th of July. We will be open normal business hours Tuesday and Thursday from 10am-7pm. We also offer a variety of calming tools for your furry friend. We sell Thunder Jackets, Calming Chews, CBD treats and supplements, Rescue Remedy, plus much more! Ask a staff member today for more information! Description: When it comes to our pets we want what is best for them. Finding a balance between what we think is best and what our pet likes is often the challenge. 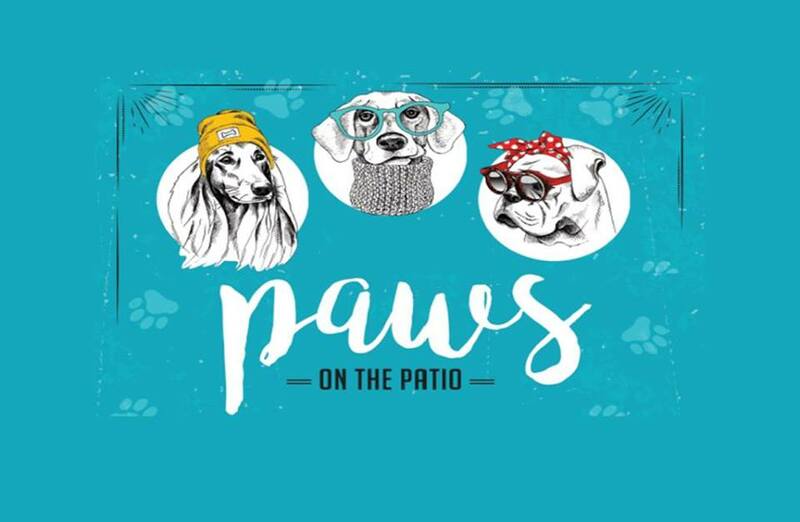 To bridge this challenge, we have partnered with local businesses to created a truly unique experience for both pets and their people in a variety of patio settings across Chico! With the health of your pet in mind, each Paws on the Patio will provide a variety of samples we think your pet will go crazy for, from pet treats, chews, food and food pairings, our goal is to find not only the healthiest options for your pet’s but also the most delicious, items even the pickiest pets can’t say no to! Is your pet a homebody? That’s okay! Come to the event yourself and pick up some samples to go. You can also partake in all the fun including discounts on food and drinks. Bidwell Biscuits, made in house by Bidwell Perk! Are you interested in providing your pet with fresh food ingredients in order to fuel a healthier pet? Come to our garden tour and learn more about various plants: herbs, fruits and veggies, you can safely include in both your garden and in your pet’s diet! This is a great event for holistically minded pet parents, interested in learning more about foods safe for animal consumption. This is a free event! Gardening is one of the best ways to provide the maximum amount of nutrition at an affordable price! Start your own herb and vegetable garden for you and your pets today! Focus will be on both external and internal remedies for common health issues in pets. To quench your thirst: check out MockingBird Coffee, located within Magnolia Gift & Garden! Serving coffee, tea, Chico Chia, cider and Luminous Lattes (turmeric latte) . Well behaved dogs welcome at event. Treats samples available through MockingBird Coffee. Bidwell Bark is the largest annual pet-friendly community event. With over 1500 animal lovers and their dogs gathering in Lower Bidwell Park for a fun run/walk and festival filled day of food trucks, kids carnival games, vendors, dog fun zone, demonstrations, contests and much more!! Bidwell Bark is one of the largest fundraisers for Butte Humane Society. Check out Sitter for your Critter's booth for a special TrailBlazer Pet Supply dog treat sample! It's The Coffee Ranch's 5 year Birthday! The goal of this class is to provide pet parents with the final tools they need to home cook for their dog, this includes balancing your dog's mineral needs, including calcium and phosphorus. Raw Meaty Bones (RMB) and how to choose the right product for your dog. Specific calcium requirements of your dog. Alternatives to raw meaty bones (RMB). Specific nutrition information depending on the health and age of your dog. The cost of this class is $20, call today and reserve your spot! The goal of this class is to train pet parents how to incorporate a variety of food ingredients into their dog's diet in order to make sure it is complete and balanced over time. Incorporating organ meat into your dog's diet. The various health benefits of organ meat. Rotating proteins to decrease food intolerance and boost the body. Cooked vs. Raw Food Benefits- what's best for your dog? The cost of this class is $20, call today to reserve your spot! The main goal of this Home Cooking Class is to learn how to best supplement our pet's current diet with fresh ingredients, including high quality protein and fat. Pet weight loss and fueling a healthy body. Learn about the tools your dog's body needs to detoxify from harmful toxins both internally and externally. Incorporate & provide your dog's body with the right kind of fats & proteins. Alter your dog's environment in health promoting ways. Learn all natural tips and techniques to decrease your dog's chemical exposure. This class costs $20, call today to reserve your spot! Is your pet itchy and uncomfortable? Would you like to learn more about what causes itchy skin? Lori, manager of TrailBlazer Pet Supply and owner of Wells Pet Nutrition, will be talking about allergies and food intolerances, common reasons that will cause a pet to itch. During the class you will also learn what you can do to help ease your pet's discomfort through diet and supplementation! Store wide discounts for all who attend the class! Ring in the holiday season by bringing your cats and dogs to take photos with Santa! The first session will be held on Saturday, November 18th and the second session will be held on Saturday, December 2nd. Cats only*: 10 a.m.- 11 a.m. Dogs only: 11:30 a.m. – 4 p.m.
*Space is limited for our feline friends. Please email feedback@buttehumane.org to set up an appointment! Photos will be taken by the amazing Sue Anderson of Black Cat Photography! Small Business Saturday Customer Celebration! Stop by TrailBlazer this Saturday for our Small Business Saturday Customer Celebration! In store you will find a variety of discount bins ranging from $5-$15 on collars, leashes, puzzle and plush toys in order to meet all your gift giving and stocking stuffer needs. We will also be giving out free samples and PupCakes to celebrate our furry friends! Discount bins on pet treats, toys, and more! Description: Do you have a dog or cat with a behavior no trainer has been able to help you with? Would you like to build a better bond with your dog? This hands-on workshop might be just what you have been looking for! Learn real solutions for common challenges you may be experiencing such as: excessive barking, chewing, biting, fear issues, reactivity, separation anxiety, shyness, and arthritis. Is your dog in need of proper social skills? Do you have a jumper when greeting new people? If so get them signed up to learn proper etiquette! Class starts May 24 and will run for six weeks taking place from 6:00pm to 7:15pm at TrailBlazer Pet Supply. To sign up visit: A Good Dog Day and make sure to sign up for the TrailBlazer location. Shelly Keel, CTC, CDW, KPA-CTP, CPDT-KA, takes great pride in and puts a high level of priority on continuing her education so that she may provide the latest available in training methods and science based information to her clients. Her training philosophy is to use only humane, positive reinforcement training methods based on the latest canine behavioral science. These techniques are not only extremely effective they produce a happy, attentive, eager-to-learn dog. The tools of the trade are toys, treats, games, praise, and life rewards (doors opened, balls thrown, etc. ), and the process is systematic, logical, and, best of all, fun! Have you ever wondered if your pet would like a particular product? Now's your chance to find out! Join us the first Saturday of the month for Sample Saturday. We will be sampling a variety of pet food products, nutritional supplements, treats and toys! Bring your pet in or take home a sample. National Dog Day celebrates all dogs, mixed breed and pure. Our mission is to help galvanize the public to recognize the number of dogs that need to be rescued each year and acknowledges family dogs and dogs that work selflessly each day to save lives, keep us safe and bring comfort. Flea and Tick season is upon us! In this class we will take a look at how you can prevent these pesky parasites naturally using diet and supplementation. We will also look at how flea & tick medicine effects your pet's body, specifically your pet's skin & coat. Seating is limited, which means tickets need to be purchased in advanced at TrailBlazer Pet Supply. Snacks and water provided. Discounts on products offered to all those who attend and everyone who attends will be entered to win a pet care package valued at over $100! All those who attend are entered to win a free groom for their dog, 2 free nail trims, free treats and a fun new toy! Dogs Naturally Magazine wrote, “In over 40 years as an animal nutritionist, Dr. Patton has worked in 25 countries and formulated diets for nearly every kind of animal. Formal study was at Penn State, Purdue and Virginia Tech. He was marketing manager for a company that recycled human food waste to animal feeds and Director of Research for Prescription Diet pet foods. As a consultant based in New Mexico for the past 30 years, Patton has worked for agriculture enterprises, zoos, foreign governments, Fortune 500 companies and local and regional feed mills and pet food companies. An adjunct professor at Penn State for 15 years, he has 25 scientic publications, two patents, one book (pet nutrition) and numerous popular press articles. Bidwell Bark is the largest pet-friendly community event held annually at Sycamore Field in Lower Bidwell Park in Chico, CA. With over 1500 animal lovers and their dogs gathering in Lower Bidwell Park for a fun run/walk and festival filled day of food trucks, kids carnival games, vendors, dog fun zone, demonstrations, contests and much more!! Make sure you come find us at the event! We will be sharing a booth with Sitters for your Critters, offering free samples, information on pet health and talking about our upcoming classes! Bidwell Bark is one of the largest fundraisers for Butte Humane Society. For more information visit www.bidwellbark.com! April is Pet Health Month At TrailBlazer! During the month of April TrailBlazer will be partnering with a variety of health related vendors to bring you the information you need to help facilitate a happy & healthy pet. We know you have questions, and we have answers. Click her to check out the Pet Health Month Calendar and find out about all the great information we are offering to you during the month of April! For more information on each health related topic click here! Pet Health Care Class: Pet Dental Health! Don't turn your nose to Fido's or Fluffy's bad breath! That odor might signify a serious health risk, with the potential to damage not only your pet's teeth and gums but their internal organs as well! In this class we will learn more about dental health, how plaque and tartar can effect your pet's body as well as what you can do to help prevent dental disease in your pet! Cost: A donated item to a pet in need. More information coming soon!One study released their State of Pet Health 2012 Report, and the news isn't good. In fact, it's extremely troubling. Chronic diseases in cats and dogs have risen dramatically over the last five years. In this class you will gain the tools you need to decrease your pet's weight slowly and effectively! The immune system is your pet's greatest protector. There are many factors that can lead to a system that gets out of balance. Come to the class to learn how your pet's immune system works, what can harm the immune system and what you can do to help boost it! Please bring a donated item to a pet in need- Help us support Catalyst and their Pet Program. See staff for an updated wish list. We are so excited to announce our upcoming educational workshops-Understanding your Pet! In order to create a good foundation of health for your pet we will be starting at the beginning! Finding the right dietary tools for your pet is the single most important step a pet owner can make. Nearly 30 percent of dogs may exhibit signs of anxiety, which may include excessive barking, trying to escape, excessive energy, destructive behaviors and even aggression. Many people, veterinarians included, often overlook the importance of diet in relieving anxiety in Pets. In this class we are going to discuss how anxiety affects the body, specific nutritional needs anxious pet need including supplement and dietary recommendations as well as the importance of exercise and brain stimulation tools. Cost: A donated item of your choice for a pet in need. Educator: Join Lori Wells, Wells Pet Nutrition, on the last Tuesday of the month to learn more about your pet’s specific health needs! Our pet’s are unique; their breed, temperament, environment in which they live, life-cycle, stress levels, anxieties, and lifestyle are all factors that influence their overall health. Your pet's health will change throughout their life and having a nutrition guide to help understand the changes can be a huge relief for pet parents! This class is for humans only. Join Shelly Keel, from A Good Dog Day, for her Pet Therapy preparatory course. This program is designed to help dogs who are social, friendly and reliably trained to polish off their skills in preparation for their team certification test. This class is being presented in collaboration with Butte Humane Society, ENLOE Medical Center and the Pet Partners Therapy Dog Program. To learn more about Pet Partners click here! For more information about Enloe's PAWS program, contact Enloe Volunteer Services at (530) 332-4575 or Butte Humane Society at (530) 343-7917 x107. Chico Dog Park Lovers is holding a Spring Photo Shoot at TrailBlazer Pet Supply! Bring the whole family, including your furry friend! The photographer will have spring related back grounds and props for attendees to choose from. $20 gets you all access to your digital copies!